Come visit our new homes that are completed and ready for you to move in! Two homes in Bella Rose are just completed and they are gorgeous! 438 and 446 Bella Rose will be open Saturday and Sunday from 1-4 PM. Homes in the Plains will be open at the same time - just look for the RED OPEN HOUSE signs! Brand new home is ready for you in the Plains at Riverside in the Belton ISD in Temple TX. This new construction home for sale features 4 bedrooms, 2.5 baths, beautiful amenities such as granite, custom cabinets, a huge work island in the kitchen, tile floors and much more. Builder is paying closing costs!! New Construction in Temple - Ready Now! Video below! 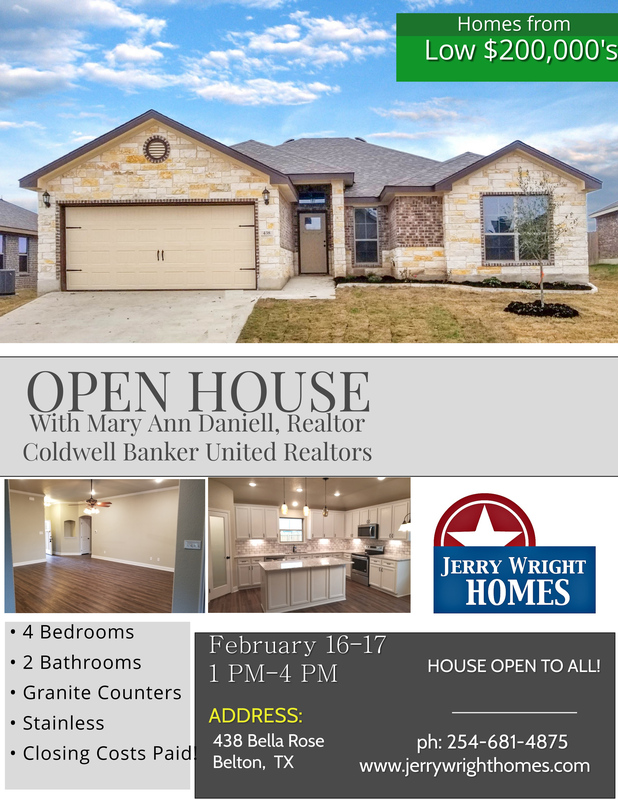 This is our incredible Extended Retreat floorplan, a new home for sale in Temple TX featuring 4 bedrooms, two baths and a ton of our upscale standard features like granite, tall custom cabinetry, ceramic tile flooring, cmarble tubs and fully tiled showers. This home is designed with a rustic touch and has a high vaulted ceiling in the living room topped off by a cedar clad beam. This kitchen has all the counter space you'll ever need and also has a pantry and a wrap around granite breakfast bar on the island. Located in the Plains at Riverside off Old Waco Road, this home is ready now! Move in and enjoy the holidays in your brand new home in Temple Texas! The Plains at Riverside in Temple - We Have Lots! The Plains at Riverside is expanding into Phase 2, and we have obtained six building lots in this new area. We were especially excited to obtain four large culesac lots that have plenty of room for larger homes with three car garages. The culdesac lots are flat and will have oversize back yards. The two additional lots on Crystal Ann have no rear neighbors. Sales in the subdivision are fairly steady as new buyers discover the area. There is NO HOA.